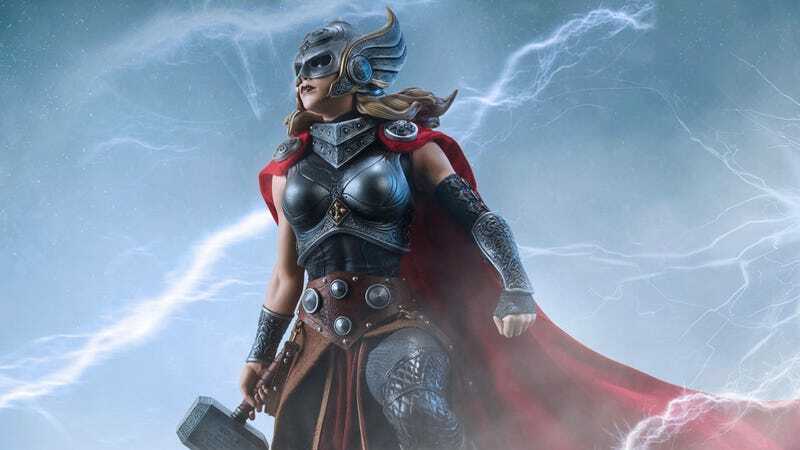 Jane Foster as Thor, interpreted by Sideshow Collectibles. For the past several years, Marvel’s Thor comics told an epic, sweeping story of heroism and feminism. Of course, we’re talking about the story of Jane Foster who, at first mysteriously, took over the mantle of Thor and did so as she was simultaneously battling cancer. The beautiful, exciting, multi-year story arc ended earlier this year and around that time, Sideshow Collectibles released a gorgeous, now sold-out statue of the character. To commemorate all of that, Sideshow sat down with two of the people primarily responsible for the run, writer Jason Aaron and artist Russell Dauterman, to talk about the story, the inspirations behind it, and much more. io9 is excited to exclusively share the video with you. If that doesn’t make you want to hunt down that statue and read/reread the run that began in October 2014 and went through March 2018, we don’t know what will. You can read much, much more about Jane’s tale in some of the below links, view the now sold-out statue here, and browse other Sideshow Collectibles here.